I'm nearly two months behind schedule for the newsletter, but for good reason. In between writing and editing, I had to finalize several matters pertaining to my parents' house and then undertook a major move of my own. While I'm glad to be getting a fresh start, there has been little free time to sit down and read a book let alone write a newsletter. I hope to do better come this autumn, when hopefully everything will be as right as rain rather than upside down. 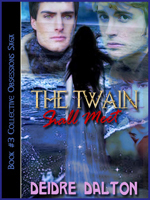 Earlier this year, I wrote several bonus inserts for The Twain Shall Meet from the Collective Obsessions Saga (by yours truly writing as Deidre Dalton). Most of the new scenes focus on main characters Scott Page and Shannon Larkin at the beginning of their relationship and are mainly sexual in nature, leaning more toward intense "foreplay" between the couple. I don't know what inspired the new passages, but I have to admit they are rather electrically charged and assimilate nicely into the existing book. Word count for the material topped just over 30,000 - which was trimmed somewhat during the editing process. The writing binge went on for well over two months beginning in February, wearing me down in the process (as usually happens). I edited the material in its entirety a dozen or so times before considering it complete, and then sent it off to my publisher at the end of May. When first published in 2012, The Twain Shall Meet had 234 pages with a word count of 131,628. The 2016 edition has 296 pages and a word count of 161,931. A new book cover will also be designed for the novel, but I can't say much more for the time being. Deb, when the inspiration comes, you run with it so there must have been a reason why you felt the need to add the new scenes. Can't wait to read them. The Twain Shall Meet holds a special place in my heart. It was actually the first book written in the Collective Obsessions Saga (originally titled Larkin). It wasn't until I decided to expand the story into a family saga that the parts before and after The Twain Shall Meet were written. Basically all eight novels in the series were inspired by one. Scott and Shannon are two of my favorite characters in the saga as well, so I hardly needed much prodding to elaborate on their intense relationship. More information about the reissue of The Twain Shall Meet will be forthcoming over the summer. Visit my blog Irish Eyes or my page at Facebook for updates. Click here to read a sample from the upcoming reissue of The Twain Shall Meet. Please Note: Material may be subject to change during the final editing process. Still in Progress . . .
As per my usual notation, storylines, estimated release dates and book cover designs may be subject to change. After the deaths of both my parents - in 2014 and 2015, respectively - I was left with the task of taking care of what they left behind. I sold their house in April 2016 and moved to a nice flat in the same vicinity, taking Rainee and Kiki with me, of course. I'm quite happy with my new digs, and glad to be out from under the responsibility of my parents' home. While moving is difficult at the best of times, nothing was worse than going through more than thirty years worth of belongings that Mum and Dad had accumulated in the house. I either gave away, kept, sold or trashed the items. It was emotionally and physically trying, and seemed to be never-ending, but it was finally done and is now out of my hair. I especially want to give thanks to the many people who helped me during the moving process: Alan, Andrew, Bryce, Chance, Diane, Eric, Gary, Kim, Liz, Matt, Mel, Mike, Scott and Tanner. There was also an entire group of about twenty people who showed up at my parents' house one Saturday morning to help clear out the items to be trashed. Sorry, I can't recall all of your names but you know who you are. I miss and think about my mother every single day, although I'm now able to laugh at some of the memories rather than fall apart. 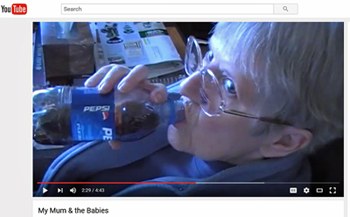 In particular, I recently viewed a video I shot of my pets in 2007, with Mum in the mix. A few months ago, I would have collapsed in tears watching the video, but now I'm able to laugh at the humor of it. To see the bit with just my Mum, click on the picture below to go to the video at You Tube. Then use the fast-forward red bar until you are almost to the middle of the video (or minute 2:27 to 3:35 of 4:43). I still have hundreds more memories of Mum - most of which are not recorded on video - and I'll treasure them all until my own dying day. Now that my life has calmed somewhat, another newsletter will hopefully be coming along in late September or early October 2016. Keep your eyes peeled! Until next time, happy reading . . .
To receive e-mail notification when a new issue of Deborah O'Toole's newsletter is published online, click here. Please Note: Receiving notices from Deborah O'Toole.Com does not constitute junk mail or spam. Electronic mail notification is activated only after individual subscription through an automated service.